Want great sounding Drum tracks? 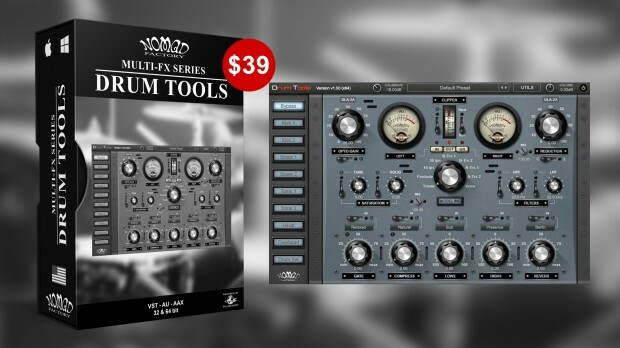 Nomad Factory’s Drum Tools is the answer and it is yours for only $39 (List $179) right now. If you want to have a successful mix out today, your Drum sounds had better sound amazing, punchy, have clarity, and sit “in the mix!” Drum Tools was made exactly for that purpose, to give your Drums a powerful/modern sound. Drum Tools is the powerful multi-fx plug-in that provides the key components you need-at-hand to help any engineer sculpt perfect drum sounds with ease! It includes discretely modeled transistors, tape and tube type algorithms and much more to enhance your Drum tracks, and give them that unique color and vibe you hear on professional recordings. This entry was posted in DontCrack, Plug-ins, Promotions and tagged Compressor, Convolution Reverb, Drum Tools, Expander, Gate, High Pass, Low Pass Filters, modern sounding drums, Nomad Factory, Punchy drums. Bookmark the permalink.